This powder has a cult following for a reason! Not only does it provide excellent coverage, it blends seamlessly into the skin with little to no effort. This powder is so finely milled, it will make your face look and feel as soft as a cloud. This mascara is a longtime favorite of mine. The wand is huge, making for an easy application as it covers every single one of your lashes. It’s also waterproof, so you never have to worry about it coming off on your date when you embrace. This concealer seriously covers ANYTHING. Dark circles, be gone. Blemishes, be gone. Period pimples — bye bye! For a date night this is one of my essentials. It’s lightweight but also covers everything you want your date to believe isn’t there. Oh and p.s — it stays on for ages. 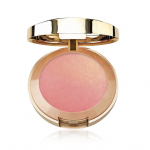 For a glamorous date night, your cheeks are going to be beautifully flushed with this Milani blush. The color, ‘Bellini’ is the perfect peachy golden hue that will look effortless on any skin tone. You absolutely can’t forget highlight on your special night! This one from Wet N Wild will have you glowing like a sunbeam (and will get your date even more smitten). Not only will this look gorgeous on your cheeks, brush this on your decollate and shoulders for even more of a candlelight glow. This may seem like a step you would want to skip, but believe me — this baby is a game changer. For spring and summer dates, this ‘tan in a bottle’ type product will make your legs look like you just got back from vacation in Cancun. This makeup will also hide any bruises or shaving cuts on your legs, so you won’t have any reason to hide them. There’s something about this lip gloss that I can’t stop using! Not only is it incredibly moisturizing, but it plumps up your lips slightly (without that awful stinging feeling) and makes your lips shiner than a disco ball. Secret weapon indeed! This cream for your hair smooths down any fly aways and makes sure your hair won’t frizz up for the rest of the night. And a bonus, it smells heavenly.